Kristen Conner goes undercover to catch a serial killer who chooses his victims in the most unlikely of places… only to discover she is his new target. Cuts Like a Knife is Mark (M.K.) Gilroys debut novel after working in the publishing industry for thirty years. And what a great debut this is. 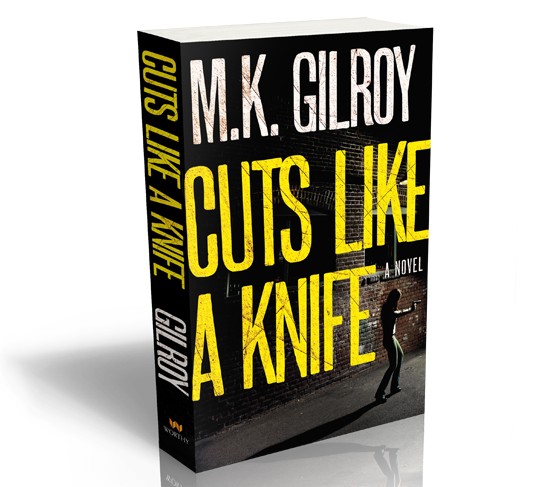 Cuts Like a Knife joins the ranks of thrilling detective stories. While so many detective stories these days feature a male protagonist who chases a serial killer, we are introduced to Kristen Conner, a female detective who has anger issues and isn’t very handy with her Beretta. Kristen is very well fleshed-out and readers will enjoy seeing her as she deals with problems with her love life, her family, and a macbre serial killer known as the Cutter Shark. One thing that makes Kristen such an enjoyable character is that detective work isn’t her whole life. She goes to church, shows up for family dinners afterwards, and even coaches her niece’s soccer team. And she has some very complicated relationships with men. The Cutter Shark is another character that is brought to life very well. Mark uses short chapters in the first person point of view that lets us get into the mind of the killer who is responsible for the murders of over forty people around the country. There are two things that a novel will have,(or should, anyway), one stronger than the other: a solid plot or solid characters. Cuts Like a Knife has both of them, but Kristen Conner shines brightly. And as this novel is the start of the series, that was exactly what Mark needed to start full-speed ahead. Note: I received a free copy of this book for an honest review by the author. All thoughts and opinions are mine.